Top international experts prove British numbers on carbon dioxide are wrong. Royal Society blunder grossly exaggerates climate impact. German born chemist, Dr Klaus L. E. Kaiser has published evidence that proves the Royal Society (RS), London, has been caught out making schoolboy errors in mathematical calculations over the duration of carbon dioxide (CO2) in Earth’s atmosphere. Backed up by a review by a leading Swedish mathematics professor the revelation is a serious embarrassment to the credibility of the once revered British science institute and a major setback for its claims about climate change. The reality is that the CO2 from a gallon out of every tank of gas will continue to affect climate for tens and even hundreds of thousands of years into the future. I wonder what schoolboy propagandist O’Sullivan will be getting wrong next week? But never fear, brave souls like Treadgold, Watts and Morano will be sure to bring it to our attention. Hmmmmmm………global warming deniers never consider the implications of their latest “startling revelation”. Reading and understanding the scientific literature would be a good start, as you point out Gareth. I wonder, for example, how they think the planet escaped from the “Snowball Earth” glaciations if CO2 isn’t long-lived in the atmosphere?. It’s all just a natural cycle, with no actual natural cycle?. How about you read and understand some science. The reason that atmospheric CO2 was long-lived during snowball earth was because total glaciation shut down the C cycle to nearly nothing. Steve, how about you heed your own advice – read even maybe a teensy bit of the literature on the topic?. If the atmospheric lifetime of CO2 is so short, how did it build up in the atmosphere when the geologic and biological processes for sequestering it were put into hibernation?. The fact that you allude to the geological and biological carbon cycle illustrates you don’t even understand the denier argument about atmospheric lifetimes. What exactly is it you do for a job?. Whatever he actually does, he should be in some rightwing political movement – peddling twaddle in the hope of conserving maximum privilege for the privileged. RW, I was being rhetorical. Google his name, it will shock you. I thought you were. Now that I’ve Googled him, I see of course that he’s eminently qualified to pronounce on climate science. We must bow before the force of his intellect. A real scientist jealously guards their reputation. They strive at all times to either get it right, or find out where they went wrong and correct the mistake. Deniers on the other hand just don’t care, not only is there little to no effort put in to understanding and gettin the science right in the first place…. but no matter how many basic, basic errors they trumpet brazenly to the world, no matter how many times they make complete fools of themselves, there is never any realisation of this. Really the deniers seem to operate as if they had nothing left to loose…. Once you have trashed your reputation you can let rip at lib…. … meanwhile millions of well educated Chinese engineers calmly build the toys we will buy from them in the age of sustainable living… while the bunch of deluded Tea Party dizzheads will have lead their country into ridicule. Suum cuique I’d say….. In the meantime however they provide aid and comfort to the likes of the Republican candidates in the US who are constructing such an appallingly anti-science platform on the issue. It’s deeply depressing to see them evidently gain traction with the voting population by denying the problem. Bill McKibben’s article in the New Republic hopes that the conservative intellectual tradition will yet assert itself. Yes, veeeery depressing Bryan. I do wonder however, how long it is before the US starts to experience some very serious consequences from global warming. It just seems totally unfair that the country that is far and away the biggest culprit for AGW hasn’t really suffered much in the way of deleterious effects. By that I mean the people, their environment is certainly suffering – the pine beetle damage for instance. And yet the poor buggers who have done the least to contribute to AGW are currently copping it. When I read Steve W : “How about you read and understand some science”, I almost fell out of chair laughing. Then I read “The reason that atmospheric CO2 was long-lived during snowball earth was because total glaciation shut down the C cycle to nearly nothing” and I did fall out of the chair with laughter! So if we raise atmospheric CO2 from 280ppm to 400ppm an analog increase in Ocean surface CO2 happens. All along the way Air and Ocean are almost in balance with a net rate of flow into the Oceans at current. Besides this exchange there are SLOW mechanisms by which CO2 is removed from the Ocean surface to the deep ocean plus chemical processes which slowly remove CO2 from the system. (rock weathering, sedimentation etc…) The key is: these processes are SLOW, much slower than our current release of CO2 into that system. Hence the fast rising CO2 concentration in both: Air and Ocean surface waters. If we were to stop adding more CO2 to the atmosphere / ocean surface system tomorrow, the atmospheric CO2 concentration would in unison with the Ocean surface concentration go down only at the SLOW rate at which these other SLOW processes can remove it from both! This indeed can take centuries to complete. It is a fallacy (Oâ€™Sullivan) to assume that excess CO2 in the air would somehow drain quickly into the ocean. 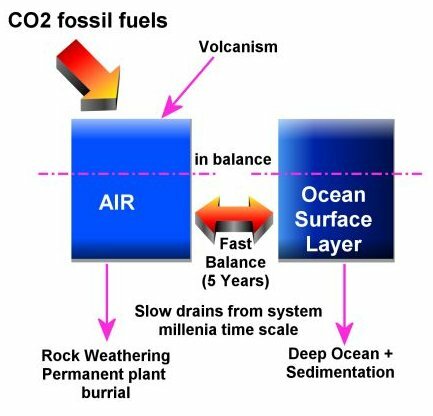 To the contrary, if we were to remove CO2 from the air we would see outgassing from the Ocean to balance this removal as the two systems (air/ocean) are really one system. The fizzy drink bottle is a good analogy. Only by removing CO2 from the combined system (Ocean surface waters and air) can we reduce CO2 levels. The natural pathways of that removal are well researched (Archer). “…..This indeed can take centuries to complete”. -> should have read: “…..millennia to complete” in my above post. This is a very simplified model but it makes it comprehensible what is going on. The two “reservoirs” Air and Ocean surface water “fill” with added CO2 as we add CO2 to the system from fossil fuel burning. The “drains” of this system (downward arrows) are small. Hence the levels of CO2 will remain raised for a very long time even after we turn of the tap of inflowing CO2. You are not discussing what Kaiser wrote. The time a molecule of CO2 remains in the atmosphere is a matter of probability. The time that it remains in the atmosphere before becoming plant food may vary from seconds upwards. And it’s also a gaffe to talk about the residence time of a “molecule” of CO2 when that’s pretty well irrelevant. What matters is what happens to the atmosphere after a parcel or a release of CO2 at a certain time. Let’s face it. Nobody cares about individual molecules of H2O in an ocean. Some molecules evaporate, some descend from the sky as rain, some molecules are taken up by mangroves at the shoreline, some came from rivers. Doesn’t matter, it’s still an ocean because of the total number of molecules regardless of their origins or pathways or destinations or individual residence times. Anyone who’d like to elaborate on the analogy as a flood or whatever is welcome. Can anyone comment on the potential use of deep saline aquifers as CO2 sinks? My understanding is that you would need to apply the gas at high pressure and then hope that it stays down there. Then you need to develop a method of getting good mixing so that the exercise becomes worthwhile in order for large quantities of gas to be pumped in. Then you need the aquifer to be in close proximity to your coal or biomass powered station. I assume it is all not as simple as it looks or we would be doing it by now. O’Sullivans article has disappeared from his site! Perhaps he was to embarrassed himself. Wonder if and when Treadgold retracts his copy of it!